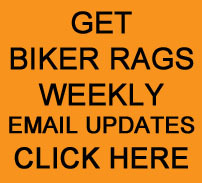 On Sunday- June 13, we had our monthly Swap Meet at Biker Rags. Since 1994, Pam has been behind the camera getting all the shots of events and customers. So today, Pam got to see things from the other side. Here she is with family and friends at Biker Rags during the Swap Meet. Thanks to everyone for indulging Pam! Return to SWAP MEETS page by CLICKING HERE.